WASHINGTON, D.C., February 7, 2019 (LifeSiteNews) – Freshman Democrat Rep. Ilhan Omar of Minnesota has embarked on a new cause: punishing a powerlifting organization for excluding biological males from women’s events. Earlier this week, LifeSiteNews reported that USA Powerlifting, the American arm of the International Powerlifting Federation, has issued guidelines rejecting use of androgens by athletes including women seeking to “transition from female to male,” as well as disqualifying “male to female” competitors entirely. “Female-to-male” athletes are allowed, provided they don’t use androgens. Noting the “anabolic nature” of androgens, the organization says it won’t make an exception to its ban on the drugs for transgenders and explains that whatever gender a competitor claims to be, biological differences remain. Breitbart reported that this isn’t sitting well with Omar, who has written a letter to USA Powerlifting and Democrat Minnesota Attorney General Keith Ellison on behalf of gender-confused constituent JayCee Cooper. “Under the Minnesota Human Rights Act, discrimination against anyone based on their gender identity is illegal. This includes in public accommodations, and in Minnesota, organizations such as USA Powerlifting,” Omar wrote. “In fact, just last month a Minnesota jury awarded Ms. Christina Ginther $20,000 after the Independent Women’s Football League refused to allow her to participate because she is transgender. Omar concluded the letter by recommending that Ellison investigate USA Powerlifting for allegedly violating the state’s “human rights” law. Ellison has not yet announced whether he will do so. 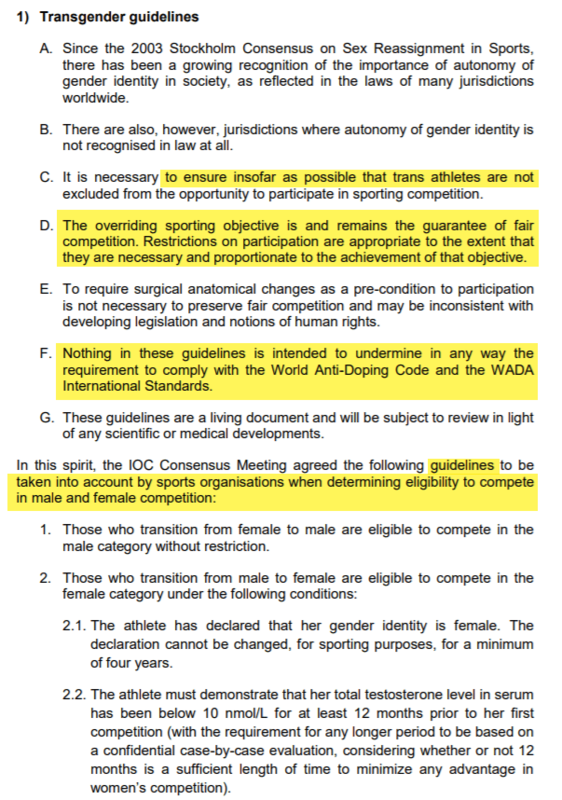 USA Powerlifting’s Transgender Participation Policy acknowledges the IOC’s general acceptance of transgender athletes but argues that it “also allows sports to determine the impact on fair play through such inclusion,” and therefore the group choose to follow the International Powerlifting Federation Medical Committee’s judgment on the matter. “Through analysis the impact of maturation in the presence naturally occurring androgens as the level necessary for male development, significant advantages are had, including but not limited to, increased body and muscle mass, bone density, bone structure, and connective tissue,” Powerlifting USA argues. Since being elected in the November midterms, Rep. Omar has faced accusations of anti-Semitism and came under fire last month for tweeting a series of false accusations against the Covington Catholic students involved in a viral video from the March for Life. Last month, she also floated a conspiracy theory that moderate Republican Sen. Lindsey Graham is being blackmailed into supporting President Donald Trump.